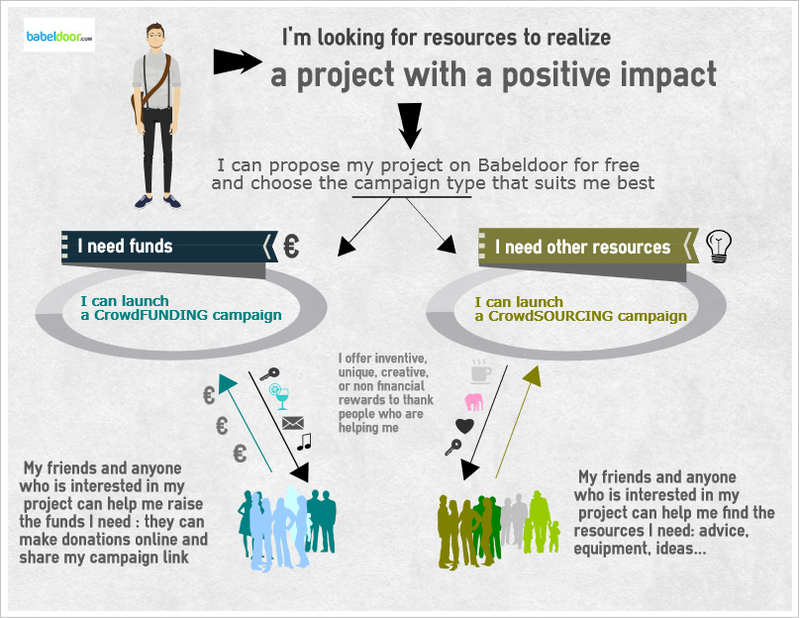 Babeldoor is a collaborative website made to facilitate the implementation of projects that will have a positive impact on the society. Project managers can choose to run two different sorts of collaborative "campaigns", depending if they are looking for finance (crowdfunding campaigns), or other types of resources (cooperative campaigns). Anyone who is interested in a project can contribute to its construction and receive unique rewards offered by the project manager. The purpose of this kind of campaign is to raise funds that are necessary to carry out a project in a limited period of time (maximum 120 days). The projects published on Babeldoor have been previously submitted on the website and been approved by our team. The project manager has to determine a funding goal in euros. He will be committed to reach this funding goal at the end of the campaign in order to receive the money. He will encourage the largest number of people to donate. He will offer unique rewards to those who are supporting the project. But the rewards will be delivered only if the project is fully funded. At the end of the period if the campaign is successful all the money raised is released for the benefit of the project but if the campaign fails the contributor's payment accounts will be refunded. Select a campaign then click on the button "participate" or click on a reward you choose. You will have to register on our site in order to automatically create your payment account . Then the transaction can be done either by credit card or by bank transfer. This will be credited on your payment wallet. When the transaction is completed, your contribution is reserved in your payment account, as "electronic money" kept on hold in your payment wallet untill the end of the campaign. Payment wallets are managed by our partners LEMON WAY and MIPISE who provide the infrastructure and ensure optimal security for every transactions. The campaign will therefore be declared successful only if the funding target has been reached or exceeded at the end of the time period. This condition is non negociable to ensure that the money raised will be uniquely allocated to the beneficiary of the campaign. Only then will contributors receive their chosen rewards. If the campaign fails your wallet payment will be refunded. Then you can either request a bank transfer (free of charge) to your bank account or choose a new project to support. These campaigns are designed to raise "advice, material and human resources" that will be useful to carry out a project. They are limited in time. Their purpose is to gather a wide range of contributors offering ideas and solutions, to help the project manager achieve his goal. The project manager offers rewards he will finally deliver at the end of the campaign to all people who have contributed. Then the contributor can tell if he would like to receive rewards and specify what reward would be the most appreciated. On the presentation page of the selected campaign simply click on the link contribute. You will have to register or log in to go further. Then you can choose the type of contribution you want to do (or sharing the campaign to friends, or posting an answer) and select the reward you would like to receive if the project is successful. The project manager will freely evaluate which were the most relevant responses to the success of the project.